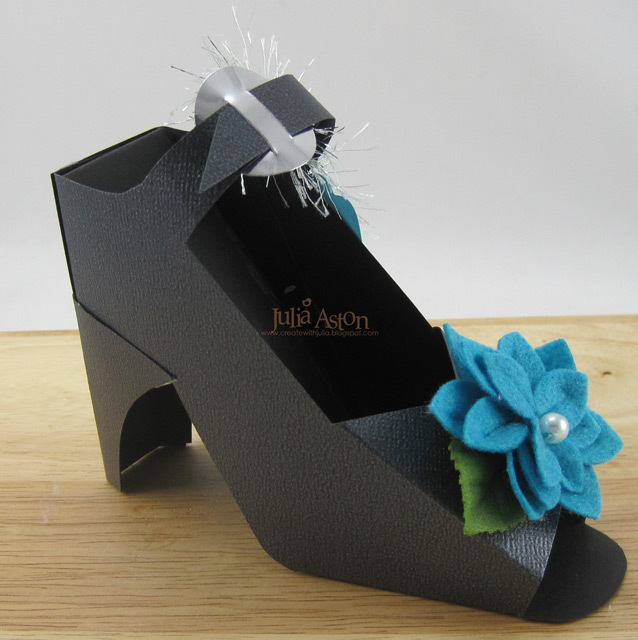 A co-worker asked me if I could make a card for her sister who will be celebrating her 40th birthday in April - I asked her what her interests were and she said 'she loves shoes' - I immediately thought of making a 3D shoe rather than just a card. I knew I had seen templates out there for such things. A adhered a little felt flower from Maya Road over the toe. 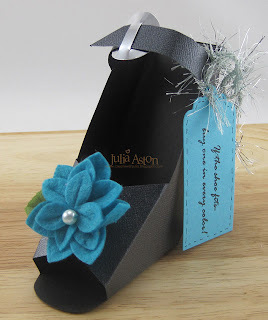 I die cut a tag and stamped "If the shoe fits, buy one in everycolor" (Hampton Arts) and faux stitched around the edge with a fine tip pen. 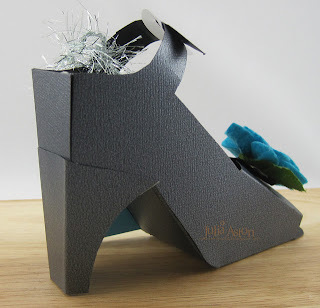 I tied the tag around the shoe strap with Glitter Eyelash Yarn by Martha Stewart. The silver 'buckle' is a punched circle with two slits cut in it with an x-acto knife so the strap slips through. And the back view - Do these heels make my feet look fat???!!! 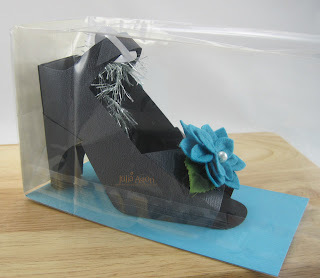 I slipped the little shoe into a flat bottom clear bag (on it's side)- adding a piece of coordinating card stock for the shoe to sit on. I left the bag open so my friend could write a note to her sister on the tag - but it then can be folded and stapled closed. Isn't this the cutest thing??!! 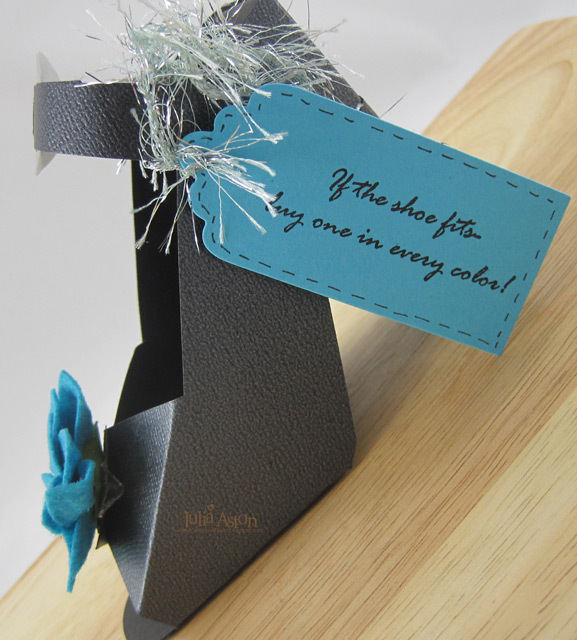 and what a fun easy gift for the shoe lover! Just change the card stock or use patterned paper to create many different looks! You could slip a gift card or a 'little something' into the shoe as well. I found the template for this terrific shoe here on Split Coast. It's a great pattern and goes together very quickly! I forgot to measure it before giving it to my friend - but it's around 5 inches long and maybe 3 1/2" tall. 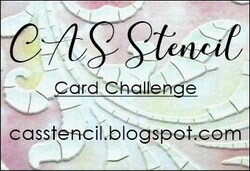 If you're looking for stamping inspiration this weekend please check out the Saturday Waltzingmouse Sketch Challenge and the Sunday Stampin' Sisterhood challenge. And good news for those wondering when Claire's next Waltzingmouse Stamp release will be - the Design Team will have sneak peeks for 3 days starting February 26th and a Blog Waltz on Release Day February 29th! 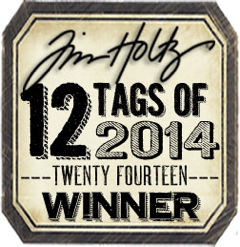 Wait until you see the new stamps!! I have had 2 very crafty days! First, last night I altered this little 4 3/4" x 4" note pad. I bought it on sale at a Utrecht Art Store. It just had a plain cover and has lined paper inside. I use books like this to record every card or project I make - listing supplies and how I made it for future reference. For this one - I cut 4 pieces of Basic Grey Archaic designer paper 3 1/2" x 4 3/4" and attached them to the covers - inside and out. I sponged the edges with Vintage Photo DistressInk. I also cut a piece 1/2" x 3" to slip inside the Pentel RSVP pen so it matches. I stamped the Cornish Heritage Farms background stamp - Lined Paper - with Terre Cotta Adirondack ink and cut a small piece off it. I over stamped the sentiment by Inkadinkado in Ranger Distress Ink Vintage photo - sponged and distressed the edges. I punched a hole in the side and attached a large eyelet using my Cropadile and looped a piece of ribbon through it. I attached it to the cover with foam dimensionals. I punched the Martha Stewart butterfly 3 times - sponged them with the Vintage Photo ink and attached them as shown. On the inside cover I stamped this fun lined note stamp - Rock & Roll Page by Hampton Arts with Terre Cota Adirondack ink - sponged the edges with Vintage photo, distressed them, and attached it with adhesive tape. Here is the back view - and you can see all the ribbons I knotted on the binding wires. I cut them about 6" each - double knotted them and then trimmed the edges. I also added a long narrow piece you can see sticking out - I use that for a book mark. I took my fun book with me to an all day Workshop I attended that was taught by Lauren Meader - I know you probably know Lauren - she has the most wonderful blog and is a past member of the Dirt Pile on SCS. 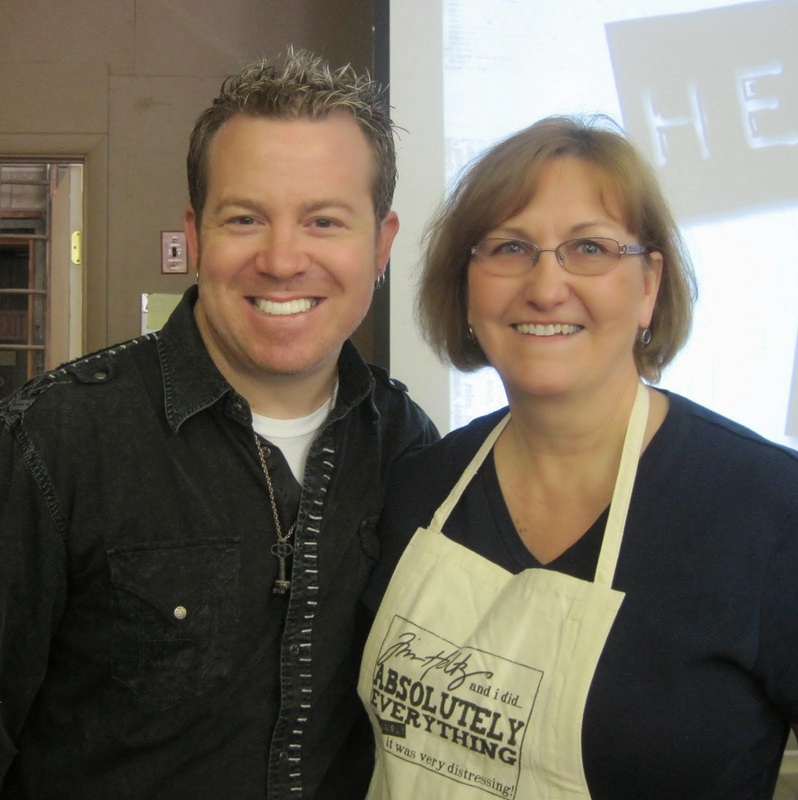 When I saw she was teaching these workshops and it was just 1 hour from my home - I jumped to register! It was held at the Papertree, 865 Second St., Manchester, NH so if you're ever in that area - stop by and say hello to the owner, Michelle, and check out all her wonderful stamping supplies - I brought two bags full of them home with me - but I left some there for you! Here is a picture of all the things we created today - I took 3 workshops - from 10 am - 5 pm! I know you can't really see them very well - but from left to right they are: a door knob hanger with a little box attached on the front - that is butterfly DP and punched butterflies on it and the sentiment says Thanks a Million. The Cylinder item has an acetate circle window on it (looks white in pic) and you fill this with candies - it's tied from bottom to top with a brown ribbon. Next is a fun Lollipop holder stamped with the cute dog sherrif from the Cat's Pajamas Set and the row of buildings from the set stamped on the brown part. There are holes punched on the top that you put the lollipops through. Next in purple is a beautiful box made from plain Bazzill paper and a beautiful floral paper that is tied closed with a gorgeous brown satin ribbon. We made 8 lovely monogramed cards using the Just Rite Monogram stamper to put inside. In front of that is a pouch that is sort of like a french frie container with a cute birthday bird stamped on it - that is made from one piece of 12x12 DP! Next is a beautiful flower basket made of layers of Nestability scalloped circles in graduated sizes - how cute is that!! And finally - another box made of 2 sheets of DP - corners tied with ribbons - and inside a stamped note pad and 4 stamped cards. A super, super creative day!! And, of course, I had to take a picture of myself with the famous Lauren - to prove I really met her! 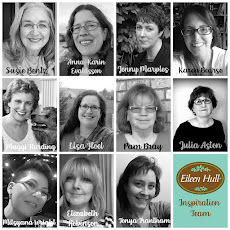 She is just as sweet, lovely and talented as she is on her blog! She is going to be running more classes at this shop and I hope to be able to get to them! And to top off my crafty day - I made this as a Thank You gift for Lauren. She had said it was her first time teaching at a craft shop (other than doing Stampin Up workshops) so I thought it would be nice for her to have something to remind her of this day. The little monogram cards are 3"x3" so you can tell how big the canvas 'bag' is - I made this out of Confetti Cream card stock by Stampin Up and a navy blue card stock. The pattern for the bag is from a book called "Paper for All Seasons" by Sandra Lounsbury Foose you can find it on Amazon.com and other places it's about $19.95. The little monogramed notes are made using the Just Rite Monogram stamp, my scalloped circle nestability, DP by Scrapborer SCRB decorative collection, and Bashful Blue cardstock by SU. I tucked 4 inside the bag. The star is another nestability cut and embossed and stamped with a sentiment from My Favorite Things Back to School set. I put a square silver eyelet on the top and threaded a piece of hemp through it to attach it to the bag. Well, - hope you enjoyed all my crafts today! Thanks so much for stopping by! I'm exhausted! 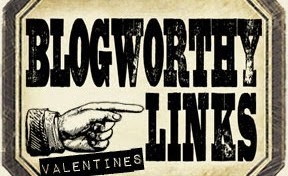 Todays quote from Poor Richard's Almanack by Ben Franklin: "If Passion drives, let Reason hold the Reins."